Tuindorp Vreewijk, Rotterdam's first garden village, was the brainchild of the banker K.P. van der Mandele. He bought a patch of land in South Rotterdam and commissioned Berlage to draw up an urban plan for it. Unlike Heijplaat, Vreewijk had no connection with a particular company. Many office clerks, council officials and teachers lived here alongside manual labourers. Berlage's design, its angled street pattern retaining the original watercourses on site, was fleshed out from 1916 on by Granpré Molière, Verhagen & Kok and De Roos & Overeijnder. As it was wartime and material was scarce, the building process took a long time to get going. A total of 5700 houses were built between 1917 and 1942. Vreewijk has always been regarded as the traditional counterpart of modernist districts such as Kiefhoek. 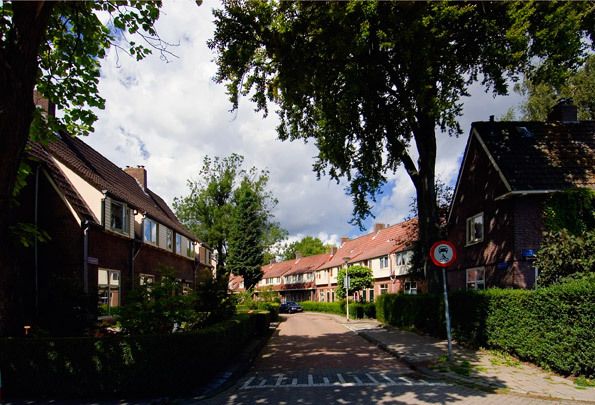 Vreewijk's buildings are indeed traditional in that they are built of brick in a site layout that makes a clear distinction between street and courtyard, but they also admit to a standardization of dwelling types and to a construction process efficiently organized along modernist lines. Most of the houses are assembled in open blocks in a north-south alignment. Monotony has been avoided by the presence of a non-orthogonal network of principal routes, green avenues accompanied by water. Much thought has been given to street profiles (the width of streets as against that of the pavement), building height and the position of trees, lamp-posts and garden hedges and walls. Greenery prevails in this garden village. The district's centre is the Brink or village green with its 'People's House'. There are shops, schools and churches but no cafés. Granpré Molière himself regarded the architecture as rather shabby, even if 'bedecked with nature's mantle'. Since the 1980s many houses have been renovated with little regard for the existing architecture; in the present century Wytze Patijn has been involved in reconstructing Vreewijk.